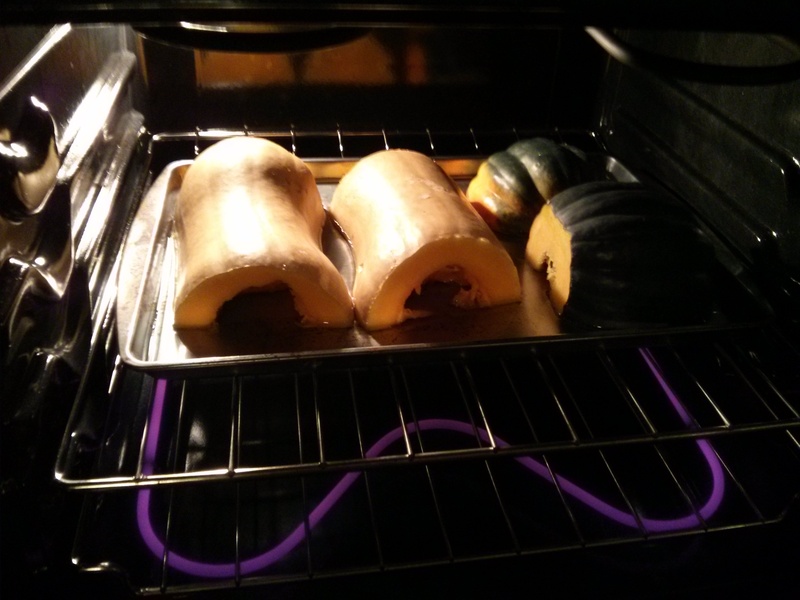 this story is about a girl named kelsey v who needed to roast some squash for an early office thanksgiving potluck. prizes were going out to those cooks who whipped up the best dishes, so this little chef didn’t waste any time getting her winter squash soup ready. step one? roast some fresh squash for the ultimate autumnal flavor. well, seeing as how this young lady had never purchased or prepared anything larger than a four-inch yellow squash in her life, she was in for a treat. she perused the shelves at publix, picking out a sizeable butternut and dainty acorn. 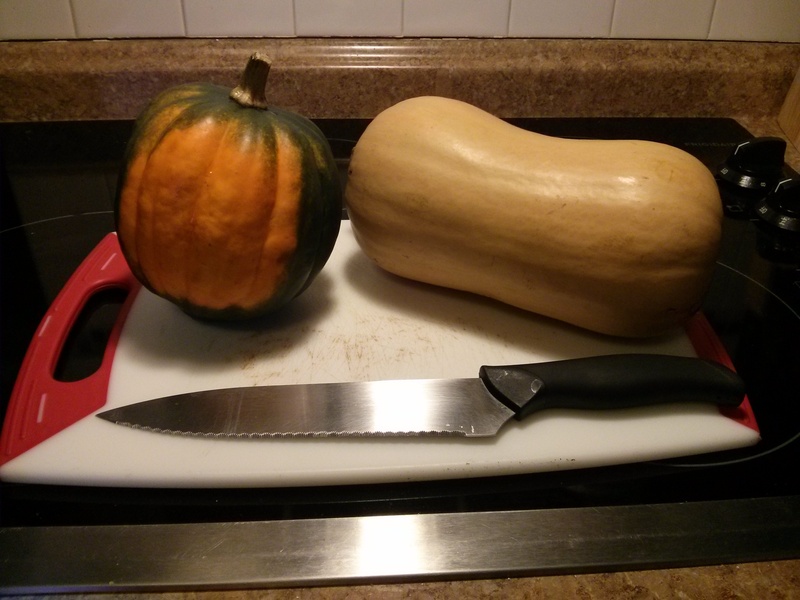 next, all she had to do was take a sizeable knife to those sweet squashes, lop off the ends, gut ’em, and halve them up for the pan. that oven was all hot and bothered at 350 degrees fahrenheit, welcoming the squashes cut side-down with about a fourth of an inch of water in the pan. things were going to get steamy! the kitchen filled with fall scents as the squashes roasted for a solid hour. after checking their tenderness with a knife, they were declared perfectly cooked! they cooled for a half hour, and then came the fun part. 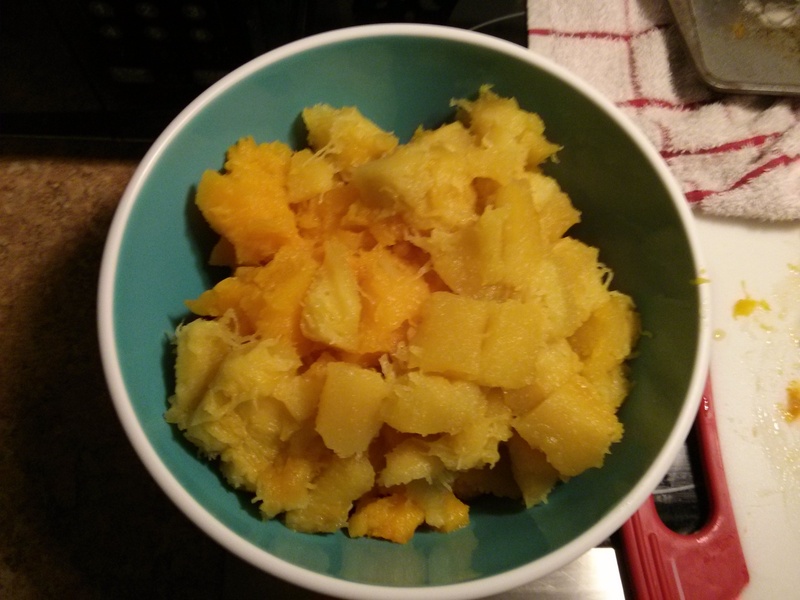 …dumped into a bowl for later use! and she was scared? they’re just little squashes!